Previously I wrote about how to use the JBI JavaEE Service Engine to increase performance when orchestrating EJB Services created in Glassfish with the BPEL Service Engine in OpenESB. That was almost 8 months ago and Netbeans and OpenESB have changed a lot and consequently I needed to update it. So I would like to provide an update using the latest Netbeans (20080402). Again, if you haven't already, go ahead and download and install OpenESB which includes Netbeans v6 and Glassfish v2. Configure your BPEL Process by dragging the SOAP WSDL onto the left side of the BPEL Process. Uncheck Do no copy if it is checked. Expand your BPEL Module and copy the WSDL into the BPEL Module's src directory. 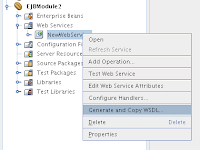 Now you should have a copy of the Web Service's WSDL in your BPEL Module. Drag this new WSDL onto the right side of the BPEL Process so that we can tie the Invoke call to it. View your CASA file by double clicking on the Service Assembly file under your Composite Application. Now you should be able to start Glassfish and deploy your Composite Application. 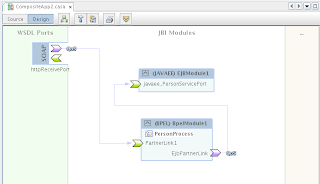 Now your BPEL Process will utilize the Java EE Service Engine. FYI, do not deploy the EJB Module separately since its included in the Composite Application. My name is James Branam and I'm the NetBeans Community Docs Manager. Your blog entry would make a fantastic tutorial for our Community Docs wiki (http://wiki.netbeans.org/wiki/view/CommunityDocs). Would you be willing to contribute it? If you need any help or have any questions, please contact me at james.branam@sun.com. I look forward to hearing from you. After i deploy the application how can i access it. Should it be something similar to http://localhost:8080/....?? Hm! No answer on how to access BPEL modules since June. Is it a big secret on how to actually use technology offered by Glassfish? You test the application by calling web service url which are created in step 5. Another alternative is create the test in composite application and select the above web serivice for testing.